The storm track looks active from Thanksgiving through next week on both coasts. There are two different storm systems in my forecast across the West in the next five days and even a third shortly thereafter. Over the next five days the heaviest snow will fall from Tahoe to the Pacific Northwest to British Columbia. California: A large storm system swings in Saturday-Sunday from Mammoth to Tahoe to Shasta. Snow accumulations up to a foot around Tahoe. Heavenly, Squaw, Northstar and Kirkwood are in good position. A smaller storm may slide in with light snow on Monday. Pacific Northwest: Two large storm systems will keep the snow going over the next five days. The higher peaks and volcanoes are in for 1-3 feet of total accumulation. British Columbia: Heavy snow continues at Whistler Blackcomb and the coastal range with 1-3 feet of new snow over the next five days. Banff is in for off/on snowfall but not as much as areas in western BC. 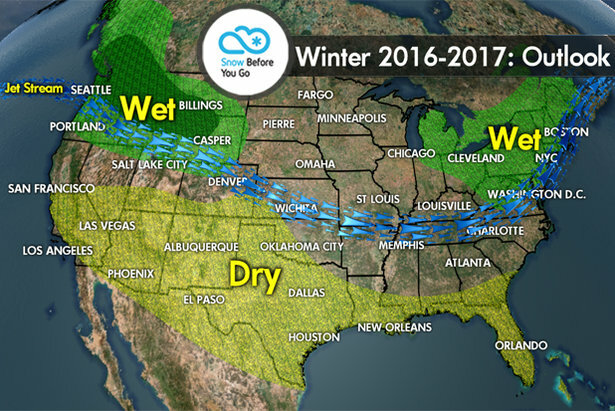 Colorado, Utah: The first of two storm systems moves through Wednesday-Thursday with a quick snowfall under six inches. 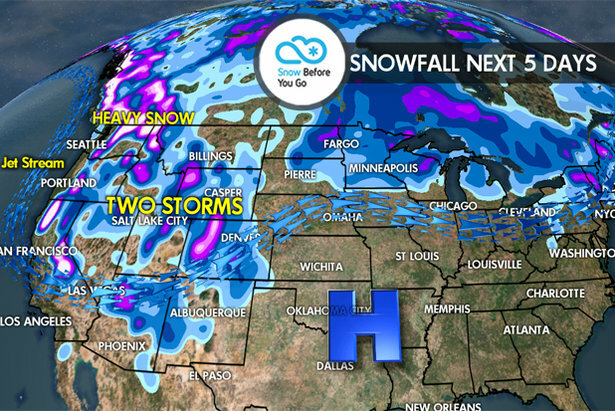 The second storm system looks bigger, arriving in Utah on Saturday and Colorado on Sunday. Accumulations 6-12 inches for Alta, Snowbird, Solitude, Aspen, Vail, Steamboat, Breckenridge, Loveland and Winter Park. A third storm arrives on Tuesday. Montana, Wyoming, Idaho: The next storm brings light to moderate snows Sunday, Monday and Tuesday. This is not a blockbuster snowstorm but will pave the way for colder temperatures starting next week. Northeast: I'm forecasting a chance for light snow on Thursday, Friday, Saturday and Sunday at the ski areas. Overall accumulations under a foot by Sunday. Areas favored include upstate New York, New Hampshire, Vermont and Maine. Jay Peak, Killington, Sugarloaf and Sunday River are in good position. One note, as the main storm slides up the coast on Sunday, it's position will be important to watch. If it shifts west then more snow will fall at the ski areas.